Not until 1889 did Judaism receive formal recognition by the British army as a distinct religious body. Before that date, Jews were entered indiscriminately in army records as C of E, Nonconformists or “Other Religions”. In 1889, the Queen’s Regulations specified for the first time that Jews should be classed separately; but only 19 men in the ranks chose to give their religion as Jewish whilst at least five times that number remained cautious or apathetic and continued under their old classification. Now that it was possible for there to be Jewish chaplains, the United Synagogue Visitation Committee in London applied to the War Office with a view to such appointments. Eventually, in 1892, the Rev. Francis Lyon Cohen became Officiating Chaplain to the Forces and Lord Rothschild gave him a letter of introduction to General Sir Evelyn Wood, who was in charge of the military camp at Aldershot. For Cohen, Aldershot was already familiar territory: he was born there on 14 November 1862. The military camp had been set up in 1855 and its uniforms, pageantry and martial music must have had an impact upon an impressionable Jewish boy. His family must have taken an interest in the Jewish soldiers and he soon saw a Jew in the army had problems of his own. Though Cohen’s ministerial career took him to South Hackney, Dublin, and then the Borough Synagogue in South London, he occasionally visited Aldershot and must have noticed Jewish men among the troops. Hence he had a special sense of satisfaction when the War Office approved his chaplaincy appointment. 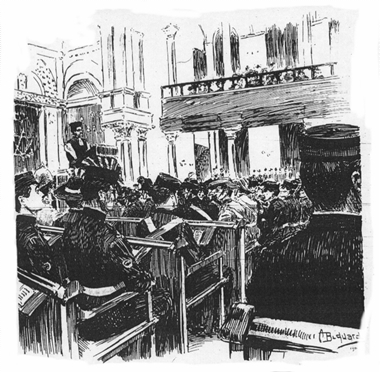 Now, assisted by the local Jewish community, he sought out and befriended Jewish members of the garrison, and as from Sunday 30 October 1892, he conducted services for them at the same time as the official church services for Christian personnel. Later he involved senior students of Jews’ College (the Jewish theological seminary) in conducting the services, which were eventually transferred to Saturday, the Jewish Sabbath. The existence of these services, reinforced by a letter in the “Jewish Chronicle” asking relatives of Jewish serving men to contact him, persuaded a number of Jewish soldiers to come out of the woodwork and declare their true religion. Cohen now embarked upon a further campaign to encourage Jewish enlistment in the forces. Disturbed by allegations that Jews were unpatriotic, he believed that enlistment in the forces would be the best evidence of Jewish loyalty to Britain. Yet he remained aware that “many of the Jews, as in the case of the other smaller religious bodies, prefer to ‘follow the big drum’, i.e. attend the general C of E parade”. It is this and not a lack of patriotism that explains why, despite this success in attracting enlistments, one in 188 English Jews was recorded as a soldier in 1904 according to his estimates, as against one in 148 people in the general population. 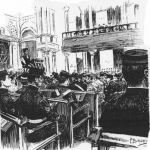 Cohen hit upon a dramatic method of drawing attention to the Jewish military presence when, just over a year after his chaplaincy appointment, he inaugurated an annual Chanukah military service at a London Synagogue. “With all the solemnity and impressiveness of Jewish liturgy, the ninth annual special military Chanukah service was held yesterday at the Central Synagogue, Great Portland Street. The Lord Mayor was present in state, accompanied by the Lady Mayoress and Mr Alderman Sheriff Bell and Mrs Bell. They were accommodated with seats on the left of the Ark, the Chief Rabbi being seated immediately opposite the civic party. The pulpit was gracefully draped with Union Jacks, and the space between it and the Almemor or platform where the service is conducted was occupied by soldiers of the Jewish faith in uniform. By 1905, the military services were acclaimed as an annual feature of Jewish communal life in London. After Cohen left for Australia in 1905, his successor as chaplain, the Rev. Michael Adler, continued the services and Cohen himself imitated them in Sydney where they continued until the First World War. Cohen’s lifetime interest in matters military was paralleled by his remarkable immersion in Jewish musicology, as joint editor of the choral music of the United Synagogue, music editor of the Jewish Encyclopaedia, and solid scholar, researcher, writer and lecturer. None of this interrupted his dedication to his Synagogue and congregation. But he had an insatiable hunger for new challenges and in 1904 accepted appointment as chief minister of the Great Synagogue, Sydney, the mother congregation of Australian Jewry. He had to attain full rabbinical qualifications in order to be equipped to head the Sydney Beth Din (the ecclesiastical court) but he found obstacles in his way. Perhaps it was jealousy of Cohen’s high profile; possibly it was suspicion (not entirely unfounded) that in some things he was not a strict traditionalist. Finally Cohen gained his rabbinical diploma and set sail for Australia. Here he resumed his military interests and became a chaplain in the Australian army; he urged enlistment in the Australian militias and, as a passionate patriot, he strongly supported conscription in the First World War. This entry is filed under Articles, British Jewry, History, Rabbinic Profiles. WordPress generated this page with 31 queries, in 0.249 seconds.